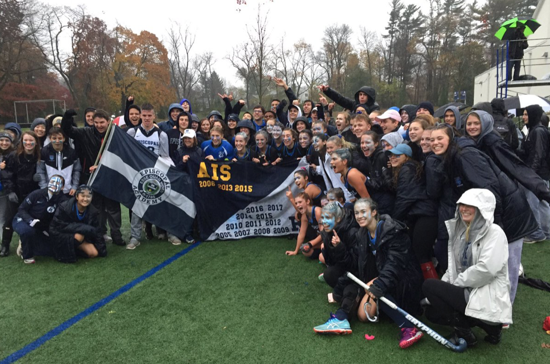 EA DAY 2018 –Once a year, the communities of Episcopal Academy, Agnes Irwin School and Haverford School come together to enjoy a weekend of friendly Inter-Ac League competition as well as fellowship between alumni, faculty, staff, students, families and friends of the respective communities. Friday and Saturday, November 9-10, marked the annual AIS-Haverford-EA weekend. Part of the tradition states that the women who win three or four games (cross country, tennis, field hockey, soccer) will take home the coveted “banner” and the men that triumph in three or more out of five sports (golf, cross country, water polo, soccer, football) will win the coveted “sweater” and have it displayed on their respective campus for an entire year to come. While some folks come to cheer on those teams, others simply came to enjoy the fun, socialize, renew old friendships and form new ones. This weekend of athletic events kicked off on November 9, with Agnes Irwin hosting EA in cross country, tennis, soccer and field hockey. Although the sun refused to shine and the rain became heavier and heavier it did not dampen the spirits of so many who came out for this longtime tradition. “Everyone is here to support us and help us do our best,” said Agnes Irwin junior Natalie Pansini of the girls’ soccer team. After two overtimes, the score of the soccer game was 1-1 and so it was declared official. The first half of the game went in to the book with a 0-0 score. That changed in the second half as Pansini tallied a goal midway through the stanza. Junior Lauren Cunningham found the net with 8:10 on the clock and that turned out to be the match. Episcopal Academy defeated Agnes Irwin, 4-1, in field hockey. Senior Maddie Rehak went on a 2-0 sprint of her own in the opening period to make it a 2-2 game. Senior Gianna Pantaleo continued that run in the second period before sophomore Emma van der Veen responded with a goal to put Agnes Irwin on the scoreboard. That was not all, however. Pantaleo scored again with 6:25 in regulation to call it a match. All athletes, coaches and spectators were drenched from the heavy rains at the end of the day but it was well worth it. EA won the girl’s coveted banner, claiming additional victories in cross country (21-34) and tennis (7-0). The boy’s events also began on Friday, Nov. 9, on the green at the Gulph Mills Country Club where the Haverford School golf team claimed the Ford's first victory of the weekend 177-178. Later in the afternoon, the Fords battled through the rain winning cross country 27-29. Haverford continued momentum into Saturday prevailing through an intense water polo match against the Churchmen 12-5 and winning soccer 4-1. This year the boys’ soccer, water polo and football events were held on the Haverford School’s campus. Arguably the most anticipated event of the weekend is the football game between the Fords and Churchmen. The rivalry between the two schools dates back to 1889, the second oldest rivalry in the Inter-Academic League. 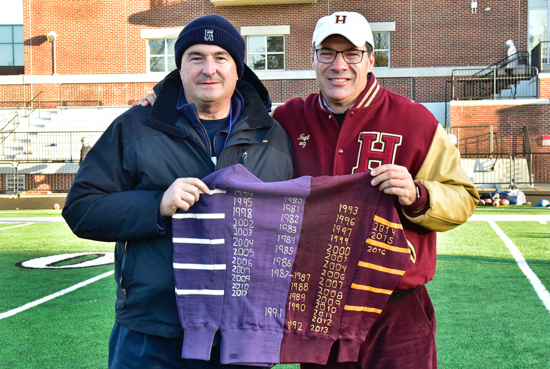 While the Haverford School was able to claim the sweater, the Fords were unable to sweep Episcopal Academy as the Churchmen won the football game 28-14. On the last drive of his high school career, EA senior running back DeeWil Barlee carried the ball six consecutive times with his last carry resulting in the final touchdown of the game. On this drive, Barlee broke the school’s record for total rushing yards, a record previously held by his older brother. Despite the end result, Haverford did not go down without a fight. The Fords put up a quick eight on their opening drive and would add another six before the half was over. Unfortunately, these were all the points Haverford was able to put up throughout the game. It was an emotional game all-around for Haverford's seniors, as this would be the last time they would play on their home turf. After the game, another Haverford School tradition occurred, as their seniors passed down their jerseys to the freshman class. Visually emotional over the fact that he just played his final game as a high schooler, Haverford School senior quarterback Ben Gerber was proud of his school for winning the sweater in his last year. In the 38 years since the sweater’s origin, Haverford has won the yearly rights to it 18 times and has tied with EA for it six times, while EA has won the sweater outright 15 times. Overall, the 2018 EA Day football contest was an emotional game, especially the seniors on both teams. Whether it was their last time playing the game they love or a start to a new chapter, the players gave it their all and wore their hearts on their sleeves.